Are you looking for gifts for someone going on a cruise? Cruising is incredibly popular these days – you are sure to know someone who is sailing soon. 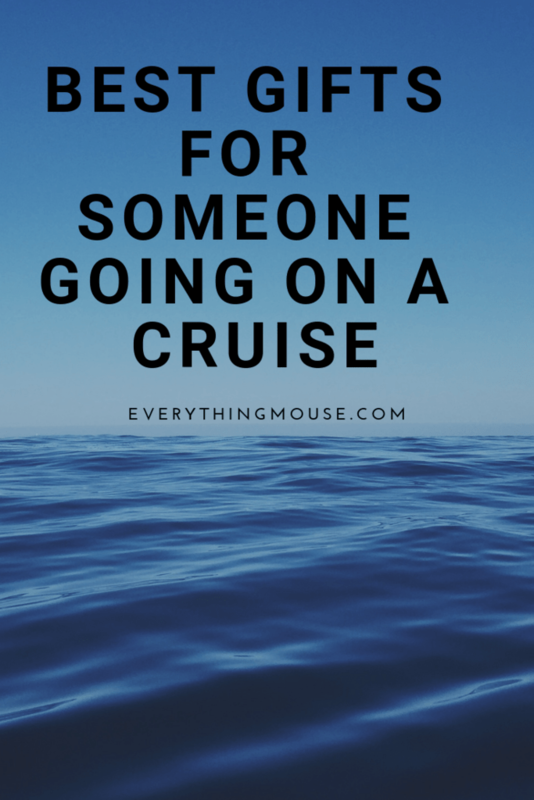 What is a good gift for someone going on a cruise? Here is our guide to help you choose what to buy for someone going on a cruise. The excitement of sailing on a cruise starts before you even leave home. Packing for a cruise is all part of the process! Here are some great gifts for a cruise lover which will make packing much easier. Packing cubes revolutionize packing for any trip! It is so much easier to keep things organized when you use packing cubes. Some cruise cabins can be tight on storage space. It is great just to be able to put a packing cube directly into a drawer so you know exactly where things are. No more searching for socks at the bottom of the suitcase. Some cruise lines, like Disney Cruise lines, allow you to bring a select amount of wine or beer on board the ship. You have to pack wine bottles in your carry on luggage so you want to make sure that they aren’t going to break. No one wants red wine spilled all over the contents of their bag! The solution? A wine carrier makes a great gift for friends going on a cruise. It is always better to be safe than sorry, which is why this Anti-Theft Travel Bag makes a great gift for someone sailing on a cruise. This great value cross body anti=theft bag is slash resistant and also includes RFID blocking pockets and slots. It is large enough to carry the essentials but small enough to be convenient to take on shore excursions. It is very lightweight and even has a tethered LED light included. It is available in a large range of different colors so there is something to suit everyone. Space is often tight in cruise staterooms. Particularly in the bathroom! This handy hanging toiletry bag is a great gift for someone sailing on a cruise. It is available in lots of different colors and is very reasonably priced. It has 7 open pockets and 3 large zippered compartments so you can easily keep items organized. With weight limits on airlines getting even smaller you really need to know that you aren’t going to go over the limit. That can be a costly mistake. When you are sailing on a cruise you are very likely to want to bring back some souvenirs. You can check that you haven’t tipped your luggage over the weight limit with these portable digital scales. Makes a great gift for someone who loves to cruise. Many cruise lines including Disney now ban drinking straws on their ships. The solution? These reusable drinking straws make a great present for someone going on a cruise. These stainless steel drinking straws are excellent quality and will last for years. They arrive with their own cleaning brush and are dishwasher safe. If you are sailing on a cruise it is likely that you will be going to spend some time on a beach or enjoying an excursion. We think that this is a great idea for any kind of travel. is perfect for cruise travel. It has room for lots of items including your phone, camera, passport, wallet, sunglasses and cruise ID. You can wear it outside your clothing or underneath for added security. It can be a pain taking a purse out with you when you go on cruise excursions. This solves the problem! It can get pretty hot at a lot of cruise destinations, particularly in the Caribbean and Bahamas. A cooling towel is a fabulous gift for someone going on a cruise to warm climates! is very effective for keeping you cool. All you do is wet the towel with clean water. You then squeeze out the water until it isn’t dripping wet. Then swing the towel in the air to activate it’s cooling properties! It really works like magic. Soon all the family will want one and its a great inexpensive gift for someone sailing on a cruise. If you are cruising there will be some great port stops or even a cruise line private island like Disney Castaway Cay. Snorkeling is a great adventure. Taking your own snorkeling gear on a cruise can save you the cost of renting. This snorkel set is highly rated. It has an excellent anti-fog lens to give you clear vision under the water. When you are on the beach it is difficult to know what to do with your valuables when you want to go into the ocean. You can just leave things in your bag and hope for the best, but that really isn’t a good idea. A Travel Lockbox is an ideal solution. This SAFEGO version is one of the best on the market. It is small enough to be portable but has plenty of space to keep your belongings safe. You can use it to safely store your phone, money, passport, cruise ID and camera. Even the new Paperwhite Kindle will fit in there! You can attach it to something like a beach lounger or table as it has a strong cable with a combination lock. It is made from strong plastic so is virtually unbreakable as well as being water and sand resistant. These towel clips are a great gift idea, particularly for someone going on a Disney Cruise. We love these cocktail themed towel clips! They are a great idea for the beach of the cruise pool deck. It can often get pretty windy at sea – so you will be glad you had your towel clips with you! These cruise themed gift ideas are ideal for friends who are addicted to cruising! Bring the magic of a cruise vacation home with this novelty cruise themed mug. If you aren’t on a cruise you are probably counting down the days to the next one! Sipping a glass of wine on your cruise balcony is a wonderful experience. But who says the fun has to stop when you are on dry land? Here is a cruise themed wine tumbler to give to your cruise fanatic friends. Which is your favorite Gift For Someone Going on a Cruise?